The authors are investigative reporters, all of whom (except Begos) work for North Carolina’s Winston-Salem Journal. 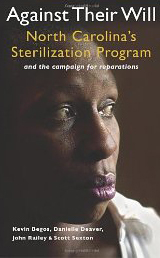 In this book, they reveal a shocking and recent eugenics program in which for more than 40 years, North Carolina ran one of the nation’s largest and most aggressive sterilization programs. It expanded after World War II, even as most other states pulled back in light of the horrors of Hitler’s Germany. The victims were wives, daughters, sisters, unwed mothers, and children; even a 10-year-old boy. Some were blind or mentally retarded. Toward the end they were mostly black and poor. What began as an award-winning series in the Winston-Salem Journal led to an apology from the North Carolina governor and the first legislation in the nation seeking to compensate victims of eugenics, or involuntary sterilization. This team of reporters combined original research and interviews with victims with work done by historians Johanna Schoen and Paul Lombardo to produce a detailed expose of the eugenics program. After the series was published, the Journal’s editorial page began a campaign to bring attention to the needs of surviving victims of the program. Now available as a book, Against Their Will has drawn praise from civil rights leaders, historians, journalists, and the public.